Acquire free computer software from the most asked for internets sites! Find popular utilities and scarce utilities. Setup software program, shareware, free apps, and demo programs to recieve in varied types. On Softempire website you can always get an actual software program, or obtain the last editions of your most liked computer tools, services programs, and softwares for fun. To acquire the right software system to try, use an easy to use directory or a fine Google. The Softempire website is directly extended: if there is the hottest version of software system you seek out, it is most likely to be in the network richest tools collection! SharePoint View Boost is product to enhance user experiences on list view. Currently it can collapse and expand columns in a standard SharePoint view. When a standard view contains too many columns, there will be a horizontal scrollbar on the browser and you should drag it to see more SharePoint columns. It is inconvenient when you want to see all concerning columns with no dragging and no new SharePoint view creating for temporary view. The above problem can be solved by SharePoint View Boost. 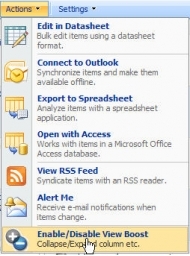 With SharePoint View Boost, you can just click a menu item in the Actions menu and there will be â??collapse/expandâ?? button on the top of every column in the view header. By click the â??collapse/expandâ?? button, you can collapse or expand the column.